The Final Mile - Get Your Materials into Customer Meetings. Looking at many B2B designs, I think their designers assume potential customers sit in a quiet, sterile room – flanked by a Macintosh 31″ Cinema display, no distractions, and a clear mindset. They assume that the searches are well-structured, and the clicks follow a logical, considered path from query, to listing, to click, to action. This one site visitor makes a decision to buy on the spot, and profits roll in. But such is not the truth. Many of the best potential customers are on your site because they are in the midst of the rather long, messy B2B buying cycle…doing research about your offer – or perhaps due diligence as they qualify suppliers – before some form of meeting. They have, on their calendar, the responsibility to gather information and present their thoughts to some form of collective – often with an executive present. So when you’ve taken the time and money to build a high quality website, optimize it for search, and obtain the customer-visit, don’t lose their attention in the “final mile.” You must support the meeting discussion in your absence – and in the absence of your website, too. Create Branded, Well-Designed PDF files, Complete with Contact Information – for each type of anticipated meeting. The material should “stand on its own” to achieve your conversion goals! For example… you may want to actually organize your handouts on the web page by the type of meeting you know your customers have. If you know most customers have a purchasing meeting to decide on acquisitions of your kind of product – support that meeting with truly helpful material – not poorly designed marketing gloss. The material may not need to be sales literature at all! Your brand presented on a solid reference guide or other material could be a great solution – either offered on your website or sent as a follow up email. Executive Summary Handout (1 page) – fast-read information for executives. 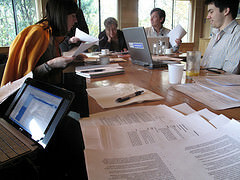 Initial Discussion Tips – a sample agenda for your team meeting. During the meeting your PDF file is printed, and looking good – while your competitor is absent or represented by horribly printed webpages – during the buyer selection process. After the meeting, your PDF file ends up on the desk of decision makers, complete with contact information. You’ve made the life of the buyer easier and made them look smart. You’ve let your customer know that you understand how their business works. B2B buying is driven by a single emotion – Fear of making the wrong choice or being fired. If you can produce insightful material that builds confidence and reduces this fear – at the moment of consideration – you will have a tremendous advantage. The mistake that most make is they haphazardly produce a quickie output from an existing brochure, or just divert existing sales literature to PDF format – without thinking of how / where it will be used. This sloppiness does little to relieve the B2B Buying Fear…. So get inside the mind of your customer – understand their pain – the meetings they must attend and the buying process – then, on your website and in your search marketing, produce material that can stand the test of this cycle. Photo by Flickr User Kennisland used via CC license.